We are a Christian nonprofit Law Enforcement Assistance Organization, with the purpose of providing assistance, encouragement, comfort, and aid to Law Enforcement Officers and their families in times of crisis. Sworn to serve, empowered to protect together we stand our loyalty never suspect. We are a team. We work as one. Our job is stressful and rarely fun. Support is a must of our friends, and peers so don’t betray but provide a confidential ear. Although we quarrel and at times disagree, When it counts and you need me, I’ll be there dependably. Just remember a cop…is both hated and endeared, but our faith in each other should never be feared. Come join our facebook group where you can keep up to date with the latest news and special words. Provide free bibles to Law Enforcement Officers. Provide memorial bibles to all Law Enforcement Agencies which have an officer killed in the line of duty. Provide memorial bibles to all the families of officers which are killed in the line of duty, or die at a later time from duty related injuries. Provide a 24 hour 7 day a week, on line bible study for officers and their families. Provide encouragement, comfort and aid to Law Enforcement Officers and their families in times of crisis. Provide a web site where officers can request a free bible, pose a biblical question , or make a prayer request or share a praise report. Assistance to LEO departments in setting up Chaplin’s programs. 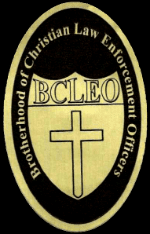 Speaking engagements for churches, schools, civic clubs and any other organizations where the perspectives and expertise of a Christian Law Enforcement Officer could be of benefit. Businesses & Individual, just like you who realize that presenting the Gospel is an indispensable element in winning people to Christ.